A hike through the mountains of the West, from the lowlands to the rocky alpine zones, reveals an incredibly diverse array of beautiful birds: Swainson’s Thrushes, Pine Grosbeaks, American Pipits and so many more to be found. The song of a Swainson’s Thrush spirals upward, as we begin a hike in the mountains of the West. The trail leads from a riverside forest in the lowlands, and as we walk, bird voices ring out. 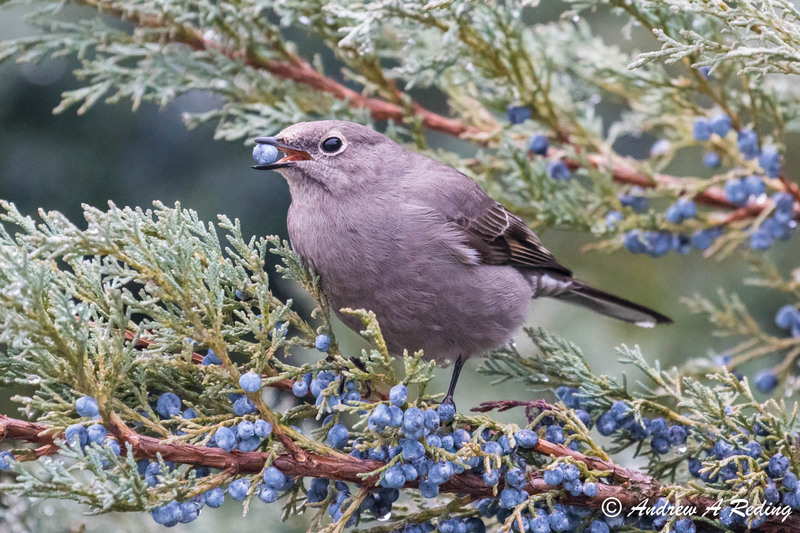 A mile up the trail in a stand of Ponderosa pines, a Townsend’s Solitaire lets loose its rush of notes. Another mile along, and among silvery green fir trees the crystalline phrases of a Hermit Thrush carry through the forest. A Pine Grosbeak warbles sweetly from the scattered evergreens, as our climb reaches the high subalpine. We stop now at the top, in the open, rocky alpine zone, and an American Pipit hovers overhead and trills a long torrent of notes. Finally, as we take in the vast, snow-draped mountain landscape, a White-tailed Ptarmigan cackles from atop a lichen-covered boulder. Listen again at BirdNote.org. I’m Mary McCann. Bird sounds provided by The Macaulay Library of Natural Sounds at the Cornell Lab of Ornithology, Ithaca, New York. Recorded by Geoffrey A. Keller and Bob McGuire.